Photo courtesy of Pat Saengcharoen. 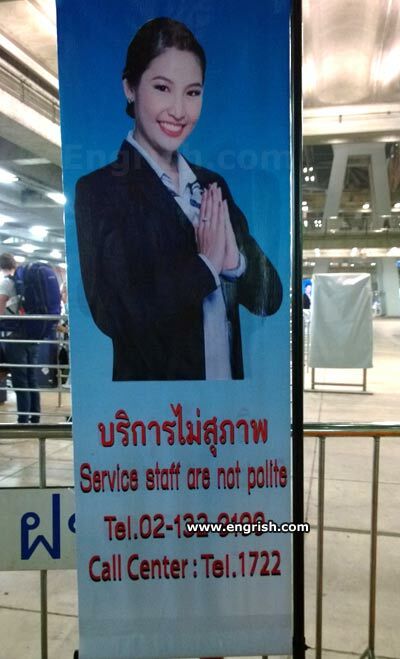 Found at Suvarnabhumi Airport in Bangkok, Thailand. We aim to not please, so please do not aim too. And no bowel movements either. Listen carefully so you know if they’re calling you “sir” or “cur”. They’ll tell you where to go, even if you’re not lost. The polite staff looks like The Thing with piranha’s teeth and is armed with bombs and bazookas. This must be Air Canada! They are cute, however, judging from the poster. And a Nasty Nameste to you to. Pressing the hands together is used as a respectful form of greeting, acknowledging and welcoming the spark of the divine in every person, even garbage like you. Service with an insincere smile. Of course. That’s the smile of someone plotting, waiting to laugh at your shortcomings. We will crush your nuts until they are this wide. Then you can mail them home, so they will be there when you get back. 2. Rub part between them until firm. That’s Ok by me. I don’t mind if my lady talks dirty at the right time. But they are still MUCH BETTER than the TSA agents. She in picture know: All men pigs! She isn’t bowing, she’s pressing her fingertips together while evilly muttering “Exxxx-cellent” like Mr. Burns. get martial arty on your arse. How can I help you, you filthy white man? Whoops . . . sorry wrong post above. Thanks for being even more honest than me. Her hands express that she’s presenting you with a lovely bouquet of all the f___s she has to give regarding your complaint.